Dooks Golf Club was probably the great Hidden Gem Links course of Ireland. Steeped in history Dooks Golf Course underwent some major changes in the 2002 under the designer of Martin Hawtree. It is not easy to go a tamper with a traditional Links Golf Course but with golf clubs and Golf Balls now going much further than ever before then it was felt that Dooks need some changes and Martin was the man to see what could be done. What was created at Dooks is a dream of a links course with new tees and greens and reshaping of holes in a backdrop of sheer beauty this is a Hidden Gem that is not so much Hidden anymore ! If you have never played Links Golf Courses before today then this is the start of a journey you never want to stop. Miss this Course at your pearl. Dooks Golf Club, situated in a panoramic setting in a corner of Dingle Bay, was founded in 1889 and is one of the ten oldest Golf Clubs in Ireland. Golf was first played on this particular stretch of true sea-side links by soldiers from The Curragh (where golf came to Ireland in 1883), who were billeted in nearby Glenbeigh for artillery practice on the Rossbeigh dunes. The 18 Holes were opened in 1970 by the President of the GUI, Mr Gerry Owens and over the next 30 years the reputation of Dooks as an honest test of traditional links golf spread worldwide. The clubhouse, which was just a tin shack in the 1960's went through 5 different "makeovers" before the present magnificent building was opened in 2005. In 2002, the committee felt that the layout of Dooks' course needed to be upgraded and renowned architect Martin Hawtree was asked to "have a look" and come up with suggestions. This resulted in a complete overhaul and the revamped Dooks was opened in 2006. The new Hawtree design has put Dooks in the forefront of Links Golf and its' reputation for excellent golf in a magical setting with a renowned friendly atmosphere is the envy of golf clubs worldwide and remains to this day one of Ireland's leading golf links. There are also wild roses, bluebells and an abundance of the daisy family. On the fairways and greens of the sand dunes area we have the same salt resistant (halogenic) and drought resistant varieties of grass but in the newer part of the course we have brent grass and fescue grass of a fine variety. Here too we have the little yellow flower (sometimes white) of the shamrock, which at times gives the fairways a yellowish appearance. Dooks has a photo album available in the clubhouse which provides more detail of the beautiful flora found on our links. Dooks have of course the usual problem with rabbits. Normally, where rabbits exist in large numbers there are usually no hares but Dooks seems to be the exception as the hare population is just as large. Occasional stoats can be seen as well as frogs and the most outstanding in this category is the Natterjack Toad. This small toad is of course the emblem of Dooks. 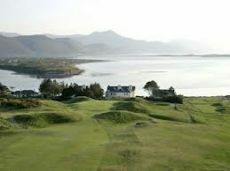 Dooks Golf Club Green fees are 85 Euros a person for 2013 season High Season. Or conbine both course with Ballybunion and Dooks Golf Vacation Packages.